With wide experience working with young people with organisations like the London Philharmonic Orchestra and a First from the Royal College of Music, I spend a lot of time both playing and teaching and have a real passion for both. 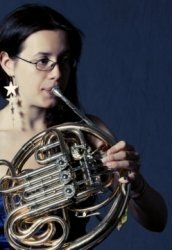 I`m Anna, and I`m a horn player living and working in London. As a professional musician, my experience includes playing with Royal Northern Sinfonia, London Sinfonietta, Mahler Chamber Orchestra, the Orchestra of the Age of Enlightenment, Sinfonia Cymru, the National Youth Jazz Orchestra (including at the 2012 BBC Proms), the European Union Youth Orchestra and the Gustav Mahler Jugendorchester. I studied as an undergraduate at the Royal College of Music, gaining a First in 2014, and completed my masters with Distinction at the Royal Academy of Music, where in 2015 I won both the Dennis Brain Horn Prize and the Bob Paxman Prize. I also do lots of work with young people! As well as my teaching below, I have done outreach work and co-led workshops for the London Philharmonic Orchestra, given pre-concert talks to audiences of 200 children (as well as groups of adults) at the Royal College of Music, worked with a youth choir leading rehearsals in preparation for a Sunday mass at St Mark`s, Venice, given workshops as a visiting tutor at Goldsmiths University and assisted with summer workshops for children prior to BBC Proms concerts. I am fully CRB checked. Above all, experience since 2013 of teaching private horn pupils anywhere from beginners to adult learners, including putting pupils through ABRSM grades. Learning an instrument should be fun, but a feeling of being good at it certainly helps us enjoy it! I am a creative teacher - as well as passing on a love of the instrument, I love trying to solve all the different problems we come up against as teachers and students. I hope my personality comes over a little in my writing - I'm enthusiastic, good with all age groups and highly motivated. I'm also organised, reliable and punctual. Please feel free to get in touch - whether it's to arrange a lesson or just to ask a few questions. AnnaFrom Julia (5/5): Anna came into our lives in a residential capacity for a week at Easter to live as part of our family here in Suffolk but also to help drive our son up to the next level for his A2. Yes I came up with a different plan, but organised and ready to oblige this young, academic, well rounded, thoughtful and driven woman came into our home and made a difference! Not only was she up early and on it … she also gave us great pleasure in her playing the horn 4 times a day … and in her wit and conversation - our son realised in this process about commitment and dedication - along with all the facts, detail and syllabus info that was required. Anna is in short a delight and pleasure to share time with as an individual and young confident tutor.